Don’t mind the rich-poor gap. Statistical analysis shows three factors—overall income growth, marriages, and local government spending—matter most for poorer children chasing the American Dream. Economic inequality is the “defining challenge of our time,” President Barack Obama declared in a speech last month to the Center for American Progress. Inequality is dangerous, he argued, not merely because it’s unseemly to have a large gap between the rich and the poor, but because inequality, itself, destroys upward mobility, making it harder for the poor to escape from poverty. “Increased inequality and decreasing mobility pose a fundamental threat to the American Dream,” he said. 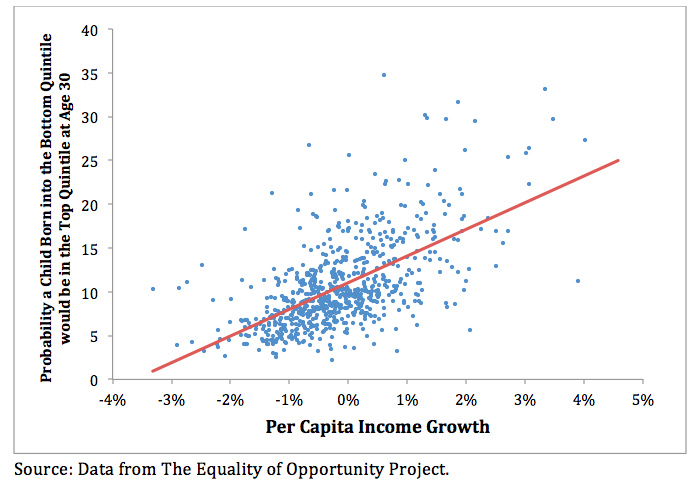 But for all the new attention devoted to the 1 percent, a new dataset from the Equality of Opportunity Project at Harvard and Berkeley suggests that, if we care about upward mobility overall, we’re vastly exaggerating the dangers of the rich-poor gap. Inequality itself is not a particularly potent predictor of economic mobility, as sociologist Scott Winship noted in a recent article with his colleague Donald Schneider based on their analysis of this data. So what factors, at the community level, do predict if poor children will move up the economic ladder as adults? What explains, for instance, why the Salt Lake City metro area is one of the 100 largest metropolitan areas most likely to lift the fortunes of the poor and the Atlanta metro area is one of the least likely? Harvard economist Raj Chetty, a principal investigator at the Equality of Opportunity Project, has pointed to economic and racial segregation, community density, the size of a community’s middle class, the quality of schools, community religiosity, and family structure, which he calls the “single strongest correlate of upward mobility.” Chetty finds that communities like Salt Like City, with high levels of two-parent families and religiosity, are much more likely to see poor children get ahead than communities like Atlanta, with high levels of racial and economic segregation. 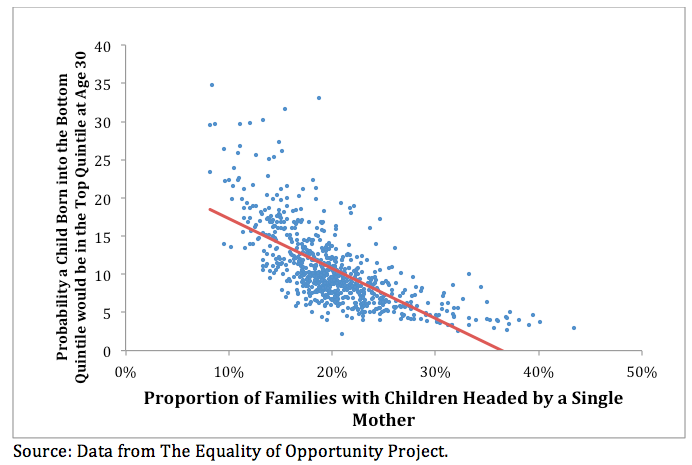 Judging by my analyses, factors like racial and economic segregation also appear to play an important role here, as they are almost as closely correlated with economic mobility for the poor as are family structure and local government spending. Children from communities marked by high levels of racial and economic segregation are less likely to rise up the income ladder. But many measures directly related to income inequality—such as the size of the middle class in a community, or the gap between the richest and poorest middle-class households in communities—seem far less important than local growth, two-parent households, and local spending. Still, we don’t know which way causation runs. High economic mobility might lead to more marriages, creating dual-earner households that would, in turn, facilitate more mobility. 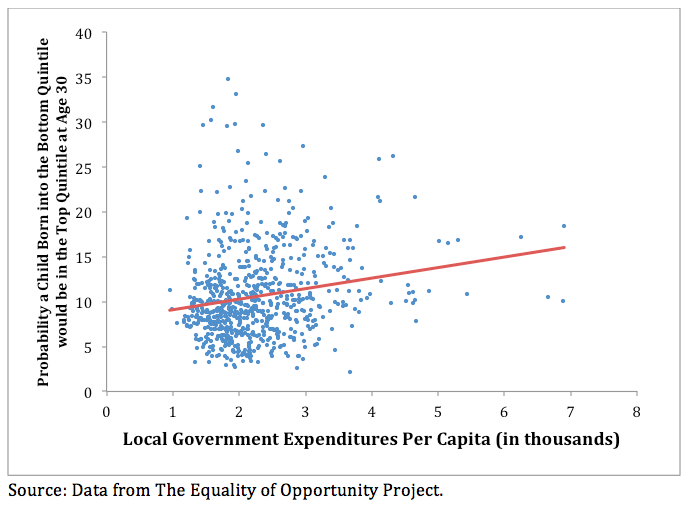 Periods of economic growth might make local governments richer, which would lead to more local spending on schools, which better prepare low-income students for college. These are knotty and interlocking variables. The upshot is that income inequality, itself, might be a tertiary issue for academics and politicians who are concerned, above all, about providing poorer children the opportunity to get ahead. As the nation marks the 50th anniversary of the War on Poverty this week, it’s worth considering that our attention to income inequality, although well-meaning, is distracting us from the most important pieces in the poverty puzzle. Growth, marriages, and local governments are three issues deserving more attention in our efforts to renew the American Dream for the nation’s poorest citizens.